Each year, it's estimated that more than 1 billion people attend more than 20,000 trade show exhibitions worldwide with the intention of gathering information and purchasing products or services. Used correctly, these events can be a hugely profitable marketing tool for you and your business. Yet most companies are wasting money and opportunities by failing to understand and apply the key strategies and skills that are critical to get results and drive your business forward. To help you be more profitable from your events, here is a list of seven critical trade show mistakes that you could be making without knowing it. At trade shows, 65 percent of exhibitors do not have a clear strategy for their event. They walk in blindly thinking their goal is just "to increase sales" or "to collect as many leads as we can." This information is worthless if there is no clear plan about who you want to sell to, what success looks like, where this fits within your bigger sales and marketing plan, how you are going to get back your return on investment and more. Without a clear, definitive strategy, your trade show presence has no hope of making a return on investment. Trade shows are more than just building a booth and waiting for people to come to you. There is a certain set of skills that is unique to this area of marketing. Yet 74 percent of exhibitors don't conduct training for their events. Exhibitors who do not train their staff risk wasting all of their time, money and more. Training is proven to help position exhibitors for success and is a vital aspect of trade show planning and preparation. Once you have your strategy in place, it is vital that you train your staff so they are equipped to execute your plan effectively. They may not want to admit it, but most members of your sales team are uncomfortable with trade shows. While they may be good at talking one-to-one with people about the intricate details of the product, they are not usually trained in the art of attracting people, prequalifying them and engaging them. As a result, they are reluctant to engage and often end up sitting around the booth waiting for people to come to them or doing it all wrong. The marketing team is not quite right either. Chances are they are used to dealing with people and behaviors from a distance. While they may be lovely, outgoing people, it does not mean they understand the psychology of how to manage a crowd and sift the time wasters from genuine prospects. Promotions requires a niche set of skills that falls somewhere between the marketing and sales worlds. If you are going to exhibit at trade shows, it is critical that you have a team with the right skill set to get the job done. While a pretty-faced model in hot pants and cheap giveaways can attract plenty of attention and certainly make you feel popular, it doesn't do anything to achieve your goals of raising brand awareness or increasing sales. In fact, models in hot pants usually are a cheap tactic that backfires because the only people they draw in are time wasters who want photos with the girls or to stare or to flirt. This not only cheapens your brand, but it also wastes your time, money and efforts. It is no wonder that more than 41 percent of exhibitors are unhappy with their outsourced promotions staff. While a pretty face certainly does help, it is better to replace those models with smart, trained promotional staff that can filter out time wasters, prequalify your leads and keep legitimate prospects moving through your sales system. This guarantees that time, money and effort are not wasted. 97.5 percent of exhibitors do not know what results they have, what return on investment they achieved or what return on objectives they delivered. What is the point in attending and exhibiting at a trade show if you do not even know if it is working for you? Even more shocking is that most businesses are wasting money on trade shows because they are not executing them correctly, and they do not even know it. It is critical to measure your results and to know whether those leads you acquired are qualified, how many turn into business, and whether the time and money you invested into the event actually made you a profit. 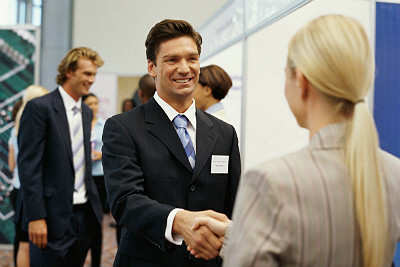 Statistics show that meeting a prospective customer at an exhibition vs. the field saves the company $943. But what they fail to tell you is that this is only if you close the deal. Many businesses think that going to the exhibition and collecting lots of data is enough, but this is only the beginning. Done correctly, lead generation can turn into sales conversions. Every trade show is different, even if you have exhibited at this show 100 times. The people are different. The location may be different. Outside influences, such as the economy or popular trends are different. Your theme may be different, and so on. Each show needs to have its own goals, strategies and messages. Each event needs to adapt to the internal and external changes from show to show. It is vital that you continually update all of the above items to ensure you are always running the most efficient and effective program possible. Lee Ali is the managing director and founder of Expo Stars Interactive Ltd, the leading global tradeshow performance and staffing agency. Lee is a sales and marketing specialist with more than 20 years experience in the field. With a deep interest in business psychology, Lee has worked extensively in the communications sector including telecoms, mobile, broadcasting, online and live marketing. Lee is a member of the Institute of Directors (IoD), a fellow of the Institute of Sales and Marketing (InstSMM) and a member of the International Association of Exhibitions and Events (IAEE).